We've got our monthly post this week from our friends at The Optical Vision Site. And, this month they're here to talk about the great online eyewear debate and cause related marketing. Does your practice give back? Let us know in the comments section what your practice is doing to give back! 2014 By the Numbers - Cause related sponsorships are predicted to reach $1.84 billion in 2014, a projected increase of 3.4% over 2013. IEG Sponsorship Report. 2013 By the Numbers - Cause sponsorship was estimated at $1.78 billion in 2013, and increase in 4.8% over 2012. IEG Sponsorship Report. 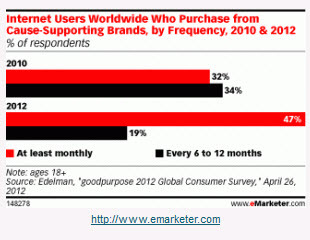 91% of global consumers are likely to switch brands to one associated with a cause. 50% of global consumers said they would be willing to reward companies that give back to society by paying more for their goods and services (44% in the U.S. and 38% in Canada). Nielsen 2013 Consumers Who Care Study. 70% of consumers are confused by the messages companies use to talk about their CSR initiatives. 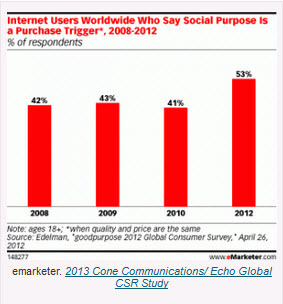 2013 Cone Communications/Echo Global CSR Study. So what are other eyecare professionals with brick and mortar stores doing? How are they promoting a sustainable marketing plan? These are only a few examples, but you might take a look at your website and see how you are faring with social responsibility. Southland Opticians believe that all deserve to see well, and they are proud to donate eyeglass frames to New Eyes for the Needy. Bring in your old eyeglasses and they will donate them to New Eyes for the Needy, and Southland Opticians will give you $50 off your next purchase of $169 or more on frames. New Eyes for the Needy is a non-profit volunteer organization whose main purpose is to provide better vision to the poor in the United States and throughout the world. Master Optician, John Macaray has volunteered to provide free eyecare to the indigenous LA population. Remote area free eyecare, collects old eyeglasses to donate to New Eyes for the Needy. He is also a memberof local Studio City organizations: Volunteers are East Valley YMCA (former board member). Studio City Neighborhood Council. Bard Optical is dedicated to educating their patients and local communities on the importance of eye health. Awareness and education are two important parts of every visit to Bard Optical. They work closely with National Eye Health Organizations as well as local Lion's Clubs to help reach out to all ages. Crown Vision Center is a sponsor of the Kids of Vision for Life Foundation. This is a way for Crown to renew its commitment to the community by providing children in multiple school districts with free vision screenings, free eye exams, and free eyeglasses through the Kids Vision 4 Life Program. To make this possible, Crown Vision Center and KV4L have been working with the St. Louis Public School District to organize and schedule visits to over 50 St. Louis Public Schools per year. National Vision Centers supports their community needs. They support Prevent Blindness America as their national charity. They also offer scholarships for the children of National Vision and participate in initiatives abroad to help provide corrective eyewear to underdeveloping countries. Rebecca Schoonover, OD has been putting on a feast for the eyes. Hors d'oeuvres from about 10 different restaurants and exotic cocktails garnished with everything from blackberries to PopRocks were on the menu for guests of Dr. Schoonover's annual Cocktails for a Cause party. "Half of the proceeds of the $45 per guest donations go to Lackawanna Blind Association, and the other half to research to prevent blindness," Dr. Schoonover said. On Saturday evening, the Tripp House on North Main in Scranton was packed with local optometrists, ophthalmalagists, and others interested in the ocular. "They know I have good drinks, good food, and the money is going to a good cause," Dr. Schoonover said. The even usually raises $3,000 - $4,000 (Source). Stanton Optical is especially proud of their community involvement program with the support of both non-profit charity organizations and humanitarian groups. The eyeglass store encourages the building of safer, stronger, and better educated neighborhoods through enrichment of the communities where they live, work, and play (Source). Eclectic Eye, a memphis destination for optometry services and stylish eyewear needs, donated nearly 140 teddy bears, and $1,250 to the Memphis Child Advocacy C enter. The non-profit organization, located in midtown Memphis, serves children who are victims of sexual and severe physical abuse through prevention, education, and intervention (Source). 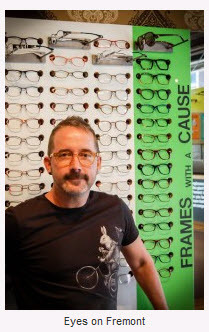 Main Street Optometry is partnering with two of frame vendors to provide glasses for veterans. Under the program, for every frame purchased from qualifying L'Amy American or A&A Optical brands, a frame will be donated to a veteran through a participating charity. Mike Burns, Practice Manager of Main Street Optometry's two locations in Dexter and Pinckney, said this was a great way to give their customers a chance to give back (Source). Eyes on Fremont promotes through a Sustainability Board on his shop in Washington. Titled Frames with a cause, the frame board is colorful and labeled. Laingsburg Eye Care collected boxes of food for the Laingsburg Food Bank. Each Halloween, Dr. Brandon buys extra candy from trick-or-treaters. This candy is sent to troops overseas who may not have access to the candies from home that they love and miss. Everyone wins. The kids learn restraint against candy, which promotes a healthier lifestyle, soldiers receive a gift from home, and the kids are rewarded for their donation and hard work. Each year, Laingsburg Eye Care also hosts a trunk show where representatives from designers bring in a larger selection of frames. There are sales ranging from 20-50% off the cost of lenses. Doctors view this as a way to decrease the cost of expensive eyewear in a fun and exciting way. In the summer, Dr. Brandon likes to keep kids active by sponsoring a Good Deed Contest. Students write a few paragraphs about how their volunteering helped the community, and other local business owners vote on the winner. In July, the winner is given an iPod with accessories or a prise of equal value. Above these events, the doctor's favorite falls on her birthday, September 27. Instead of receiving gifts, they give free eye exams to people in Laingsburg who are in difficult financial situations. They also receive free eyeglasses from the lab. "I wish I could do this more often, even though it is a crazy day," says Brandon. Aside from helping her local community, Dr. Brandon has also traveled to Chile to build a church. A year later, she traveled to the Dominican Republic to provide vision services and glasses to those in need. Discerning Eyecare, located in downtown Iowa City, is sponsoring their Eye Gave Back Campaign to benefit The Crisis Center of Johnson County's Food Bank program. Supporting the community, one frame at a time, Discerning Eye will donate $15 for each frame sold in December toward the purchase of food. Since 2006, they have given over $30,000 to the Crisis Center through this annual campaign. Owner, Joni Schrup and her son, Sam, are both graduates of the University of Iowa, and have a strong commitment to give back to the community. Want to see more from The Optical Vision Site? Check out their blog!